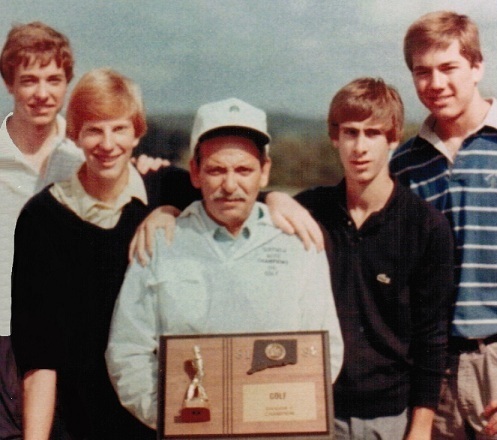 ​​​The 1982 Suffield High School Boys Golf Team team finished with a record of 18-1 overall in the regular season, 8-0 in NCCC matches, and won the Division II State Championship. Led by Coach Jim Gregor, the team had fantastic depth, with a lineup of Russ Fricke (Junior, #1 player), John Kulas (Senior, #2 player, Team Captain), Jeff Brackett (Junior, #3 player), and Bob Brackett (Senior, #4 player), all of whom were returning starters from an undefeated NCCC season the previous year. They started the 1982 season 13-0, including dominant victories over Tolland, Somers, Granby, and Farmington (in the snow) as well as a victory over out of conference Division 1 rival South Windsor. During this early season streak, Fricke was medalist several times, including a school record 69 in a dual match over Windsor Locks and Fermi (a record he broke the following year), and Kulas was medalist twice, highlighted by a key 75 against South Windsor. Jeff Brackett was also medalist twice, including a 78 against Bloomfield, and Bob Brackett chipped in consistently with solid rounds. The lone blemish on their record came in a very close return match at South Windsor where they lost the team aggregate by a mere 3 strokes. They then bounced back with strong victories against Ellington, Tolland, and Windsor Locks, and finished with a rout of Granby which was punctuated by Fricke’s 71. The result was a second consecutive undefeated NCCC season for the Wildcats (the 3rd of an amazing 9 straight NCCC titles for Coach Gregor) and the best overall record in team history. Their dominance in conference play is further illustrated by the fact that they allowed 1 point or less in 7 of the 8 NCCC matches, with 5 shutouts, and won a total of 96 out of a possible 104 points. After the regular season, in a warm-up for the State Championship team tournament, Fricke and Kulas would place tied for 3rd in the prestigious Michael J. Chappa Memorial Two Man State Tournament, the highest finish by any Suffield team at the time. The team then entered the Division II State Championship tournament at Torrington Country Club ranked #1 in the 20 team field. On a day when scores for the entire field skyrocketed due to almost unplayable course conditions as the result of a major rain storm the previous day, the Wildcats overcame the elements and managed to tie for first when all 4 players made clutch pars on the 18th hole. Playing in the last group of the tournament, Bob Brackett made a dramatic 10 foot putt to force the playoff. They would not be denied in the ensuing 3 hole playoff with Joel Barlow, as all 4 players turned in a solid performance to give Suffield a 2 stroke victory. The 1982 SHS golf team proved how well-rounded they were all season long, with wins in the sun, wind, rain, and even snow, and showed tremendous balance from all 4 starters. Coach Gregor was a major factor, as he had an uncanny knack for stabilizing and motivating the players with his input on both the physical and mental aspects of the game. This combination led to individual honors for the entire lineup, as Fricke was named to the All-State team, and he was joined by Kulas and both of the Brackett brothers on the All-NCCC Team. For the team as a whole, it added up to Suffield High’s first State Championship on the Links.